Holiday Cards are all addressed. PomPom Garland has been made! And I can not thank Beki enough for introducing me to this idea! I am so happy with this. And, oh yeah - I did finally get the laundry pile dealt with too. I may not be done with everything from Friday's list yet - but at least things are moving forward! Baby K is very sweet. You are a bear making machine. I love the pom-pom garland. It looks so pretty with the colored lights on your tree. this is the first year i finally wised up and typed all the addresses into a mail merge. i'm on the computer right now because i'm suppose to be printing them off. guess i got a little sidetracked. What a great garland! And even better with the memories. You are so on top of things with the Christmas cards! Shutterfly just emailed me today to say that they'd shipped ours -- and to expect them 12/18! Looks like I'll be rationalizing again that anything mailed by 12/24 is legit. Oh well. Awww, so cute. You are waayyyyyy ahead of me on the Christmas card thing. I think my goal is going to be any time before 2007. I'm just getting my cards out today, though I've had them for a good 3 weeks. It's the darned addressing that gets me. Once I finally sat down to do it, it didn't take all that long at all. Your pom poms look great! I'm seriously in love with those bears. They are so, so cute! And I'm with you on the addressing all my cards. I love to have nice handwriting and pretty envelopes. I truly live for this kind of stuff. Isn't that silly? Valentines are a big deal for me too! 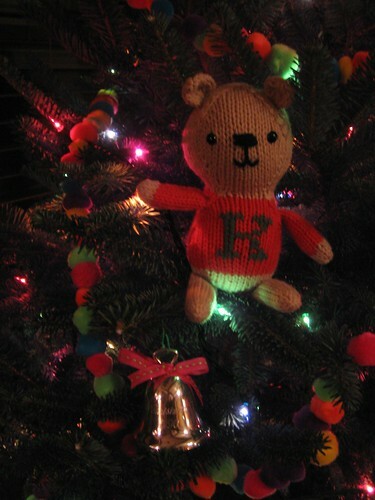 The tree looks great with the pom poms! Love the little bear & I am glad you had some quality Mom time. you're itchin for a callous on your writing finger, aren't you? I just finished doing my christmas cards it took me all of 30 minutes. Printed our names and best wishes on them from the computer. printed off address labels. had pre-printed return labels and then had an assembly line inserting, stamping and sealing. Great and fast way to do them. Loving it! I know I say it all of the time , but I love your bears! sorry i was a little behind due to Renegade. The beaded tree- you have the patience of a saint to get that done! It's beautiful! the bear as per usual is ADORABLE! and i freakin LOVE it when the hot now sign is on..i can eat 1/2 a dozen when they are warm. LOVE the ornament! You got all that and laundry done too?